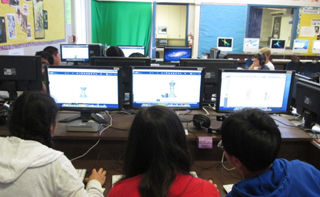 Welcome to the Multimedia and Digital Media elective program at Cupertino Middle School. The Multimedia and Digital Media curriculum is designed so that all students at any level have fun learning and applying skills in technology. Students of all ability levels will be able to find a class they love! The Multimedia class runs 7th and 8th grade students through the basics and beyond. Beginning with the MS Office portfolio, iLife, and iWork, students learn to design projects using all of the advanced word processing, presentation and spreadsheet tools . 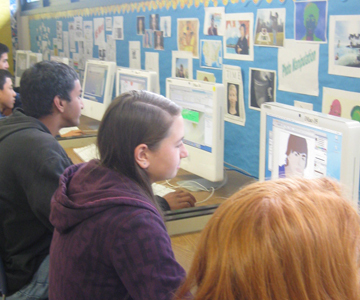 From there, students quickly progress through acitivities in graphic design, Photoshop, frame animation and iMovie. 8th graders who have completed Multimedia or have a high level of computer savvy can sign up for Digital Media. Using Adobe's Creative Suite CS4 (Photoshop, Dreamweaver, Flash, Illustrator), students in Digital Media experience state of the art multimedia software and work in a web-based environment to show off galleries of their work on the World Wide Web. Having mastered iMovie, Digital Media students move on to using Final Cut pro for video production, and get the opportunity to work with our new 3D printer! "Good Morning, Cupertino!" 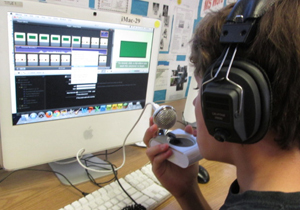 Students in the Multimedia Publications class are responsible for producing Cupertino Middle School's daily announcements via a video webcast. This is an elective for 7th and 8th graders who are adept at using multimedia software like iMovie or Final Cut Pro to create video and online material.